BMW unveils its 600-hp V12-powered top-of-the-line 7 Series. 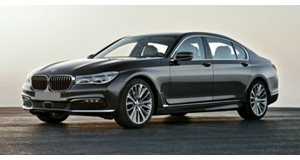 From the moment the sixth-generation 7 Series debuted last year, we’ve been waiting patiently for the extreme iterations of the full-size luxury sedan. And like buses, two arrived in quick succession, with this, the range-topping BMW M760i xDrive following the reveal of the Alpina B7 earlier this week. As predicted, at the heart of the first ever 7 Series M Performance model is an M Performance-tuned variant of the 6.6-liter twin-turbo V12 that sits in the Rolls-Royce Wraith. Developing 600 horsepower at 5,500 rpm and peak torque of 590 lb-ft at just 1,500 rpm, the M760i will shift its considerable bulk (it may have lost 190 pounds but it's still over two tons) from 0 to 62 mph in just 3.9 seconds en route to a governed top speed of 155 mph. The eight-speed Steptronic Sport Automatic transmission has been specially tuned for sportier gear changes and quicker downshifts, and comes with Launch Control. Steering-wheel mounted paddle shifters will provide owners with some fun whenever they decide to give their driver the day off. BMW’s xDrive system, while distributing torque front and rear, will have a rear-wheel bias in the M760i, adding to the excitement. Special features on the all-aluminum V12 block ensure vibrations and noise are kept to a minimum, and the combustion process is optimized thanks to high precision injectors centrally positioned in the cylinder head resulting in greater performance and lower fuel consumption. The mono-scroll turbos also supply lots of dense, cool, compressed air to all 12 cylinders. Other unique features include Double-Vanos continuously variable camshaft timing, and a volume flow-controlled oil pump that supplies the required amount of oil in any given situation. This enables drivers to check the oil level status via the instrument cluster instead of dirtying themselves with the dipstick. Distinguishing the M760i from other 7 Series models is an M aerodynamic package with a distinctive front fascia boasting two large intakes made bigger thanks to the removal of the fogs, and Cerium Grey trim and accents. Exclusive mirror caps, V12 badges, M rear spoiler, and a set of unique 20-inch double-spoke alloys in Cerium Grey metallic wrapped in Michelin Pilot Super Sports are further examples this is no ordinary 7er. The sporty rear fascia beautifully frames the M sports exhaust, whose twin tailpipe embellishers get V12 geometry. From civilized refinement to booming soundtrack, the M Sport exhaust also receives rear silencers and flap activation allowing drivers to cruise in silence or make some serious noise. On top of the latest iDrive 5.0 with touch screen tech, voice command and gesture control, and new driver assist and semi-automated systems the new 7 Series received, the M760i gets the latest Surround View system, including 3D and Panorama View in the Control Display. The interior also sports aluminum door sill plates with an illuminated V12 logo, an M leather-wrapped steering wheel, M logos, stainless-steel M pedals and driver’s footrest, and Piano Black trim. We hope to see the new BMW M760i xDrive in the metal at the Geneva Motor Show in a couple of weeks’ time.